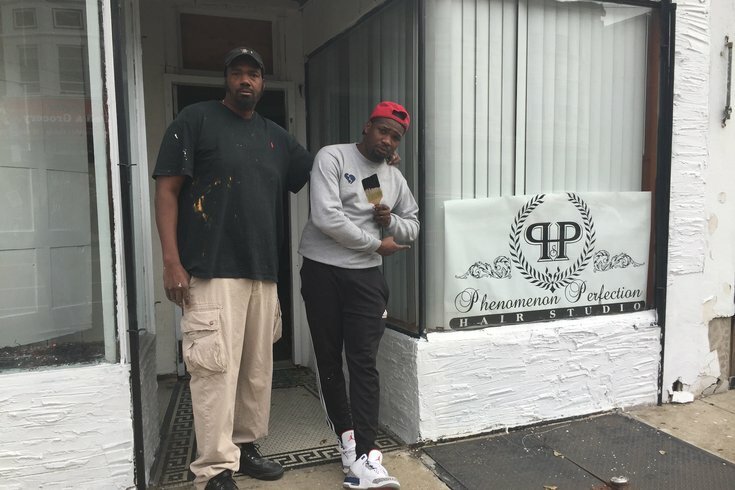 In happier times, Brennon Jones (right) and Sean Johnson worked together to ensure Phenomenon Perfection Hair Studio was ready for its grand opening. Less than six months later, they're leveling accusations about fraud against one another. How quickly lives can change. It’s been fewer than 10 months since PhillyVoice first brought you the story of Brennon Jones’ mission to cut hair for the homeless in Philadelphia and beyond. One day in early January 2016, he set up temporary shop at 15th and Walnut streets in Center City. It was the first day of his mission. On Thursday, Jones was toiling inside the Olney storefront that, on Sunday, will officially open its doors as Phenomenon Perfection Hair Studio. "It's crunch time, but we'll get done in time," he said while leading a tour of the shop. Suffice it to say, Jones was overwhelmed by the outpouring of support, including inspiring messages of gratitude from as far away as Barbados, Brazil and Nome, Alaska. To say his story has gone viral would be an understatement, and it's only drawn more attention since last month, when Sean Johnson – owner of Taper’s Barbershop on Old York Road in Ogontz – gifted Jones with a barbershop of his own. Jones, Johnson and other close supporters were working hard to get it ready for the grand-opening celebration. At 3 p.m. Sunday, Phenomenon Perfection will open with a ribbon-cutting ceremony at the shop at 5925 Old York Road, just steps away from the 35th Police District headquarters. Though he now has a roof over his barbering head, Jones will continue to provide haircuts to those in need. He told PhillyVoice he will set aside Mondays to provide haircuts and meals to the homeless and plans to have special days with discounts for college students and police officers, firefighters and other public-sector employees. “All of this has been so wild,” he said. “With all the problems in the world, the shootings, the police brutality, what I’ve seen is that there are still people out there who care. And in Philadelphia, what we’re supposed to be – the city of Brotherly Love – is on full display. Jones said he hopes to celebrate with anybody who has supported his mission, and any member of the public who wants to show up to see what’s happening at his new shop. "I can't wait to celebrate with everyone who's supported me along the way," he said.